The Soapbox Collaborative is a UK based Charity established with the aim to ensure clean safe care at birth. It is a needs-driven initiative, meaning that all support – technical or financial – is based on explicit local assessments of the current situation, of the specific needs, and of the options for achieving a lasting effect beyond the benefits of any input from Soapbox. Professor Wendy Graham, LSHTM, has been the leading figure in establishing the Soapbox Collaborative and is currently the Scientific Coordinator of the project. 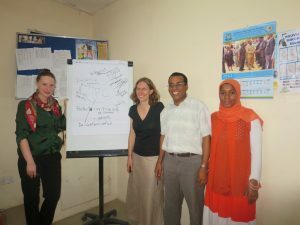 The Soapbox Collaborative currently works in collaboration with partners in Ethiopia, Gambia, India, Tanzania and Myanmar. Research studies to improve understanding on infections related to delivery and on their prevention. The LSHTM team works on the second of these two arms. Their research has included a mixed-methods approach to assess the status of water, sanitation and hygiene, as well as infection prevention control in healthcare facilities in the Gambia, Zanzibar, Malawi and Myanmar. Last year the team completed a formative study in Zanzibar to explore the behavioural determinants of hand hygiene by birth attendants. The results reveal the importance of avoiding hand and glove recontamination after washing hands. They worked with WaterAid Malawi to assess WASH infrastructure requirements and promote hygiene behaviour change in 15 rural health centres. They have also been reviewing existing literature on the epidemiology of maternal peripartum infections. The team is about to start an evaluation of a training package for hospital cleaner’s, developed by the Soapbox Collaborative. The before-after study of cleaning behaviour and environmental cleanliness at three high-volume hospitals in Tanzania is being conducted in collaboration with Ifakara Health Institute.